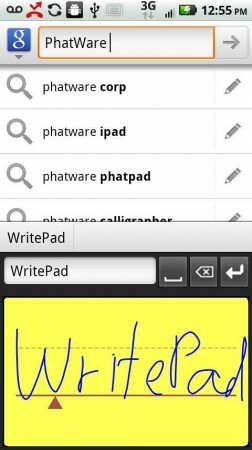 Writepad is a text input method for tablets and phones. Oh great another keyboard app, Android really could do with a few more of those. This one though is different, it uses either your finger or a stylus to capture your handwriting. Yes like you could do in Windows Mobile 5 (shudder). The developers have really implemented the idea well. 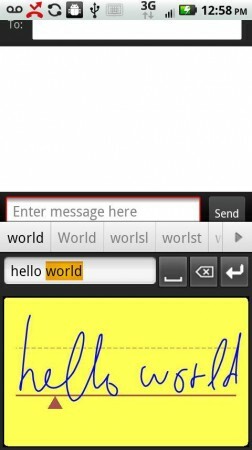 Writepad installs itself as an input method, so you can write out text anywhere within the Android system. A lot of similar apps just work within a note taking app. Using Writepad it turns your scribble into normal text, which in my case is easier to read. At first the app made very little sense. When it first loads up you are encouraged to read the tutorial. In a similar manner to any instruction book I decided that I would not need any help and that I would “figure it out”. Oh how I was wrong. Nothing I wrote out converted into words it was just a mess. So I really suggest you go through the tutorial. Once I had used the app for a little bit and I realised you could delete words, end lines and just continue writing I really got the hang of it. 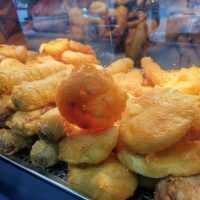 The app is designed for tablets or phones. On a phone it did feel a little strange and slower than using the onscreen keyboard, they even recommend you use your phone in landscape to use it. On a tablet though it felt a lot better. I don’t really like onscreen keyboards on tablets (apart from the webOS one) and having a different input method was nice. The app also has several different modes. A mode for web addresses or passwords, a capitals mode or numbers. Overall it is a great useful app and when combined with a decent stylus and a selection of other good tablet apps you are onto a good combination. Oh nearly forgot to mention the price. It’s £6.99 which I feel is a little steep. But if you hate onscreen keyboard and really really want to write stuff out then this is for you. Here is the blurb from the Market. – Integration with any application allowing text input, such as email, SMS, notes, word processing, and others. – Statistical analyzer, which improves overall handwriting recognition quality by addressing common recognition errors. If this feature is enabled, WritePad will learn the user’s own handwriting style. – Customizable auto-corrector, which automatically fixes common spelling and recognition errors. – Editable user dictionary to improve recognition of custom words and names not included in the main dictionary. – Built-in full keyboard with autocomplete; if needed, users can switch between keyboard and handwriting with a single touch of a button. – Four basic recognition modes: cursive/mixed or print for general text entry; Numeric for entering numbers and phone numbers; and Internet for entering email addresses and URLs. 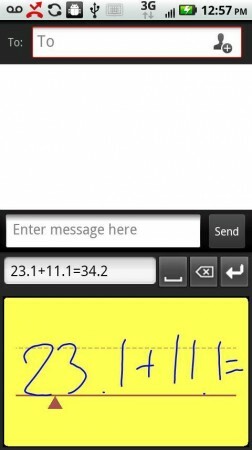 – Built-in calculator, enabling users to write simple equations such as “22.3+15.66=” and WritePad will calculate the result. Here is the video explaining how it works.